The Hamburger Galaxy is about 100,000 light years across and occupies an area of 15 by 3.6 arc minutes of apparent sky. 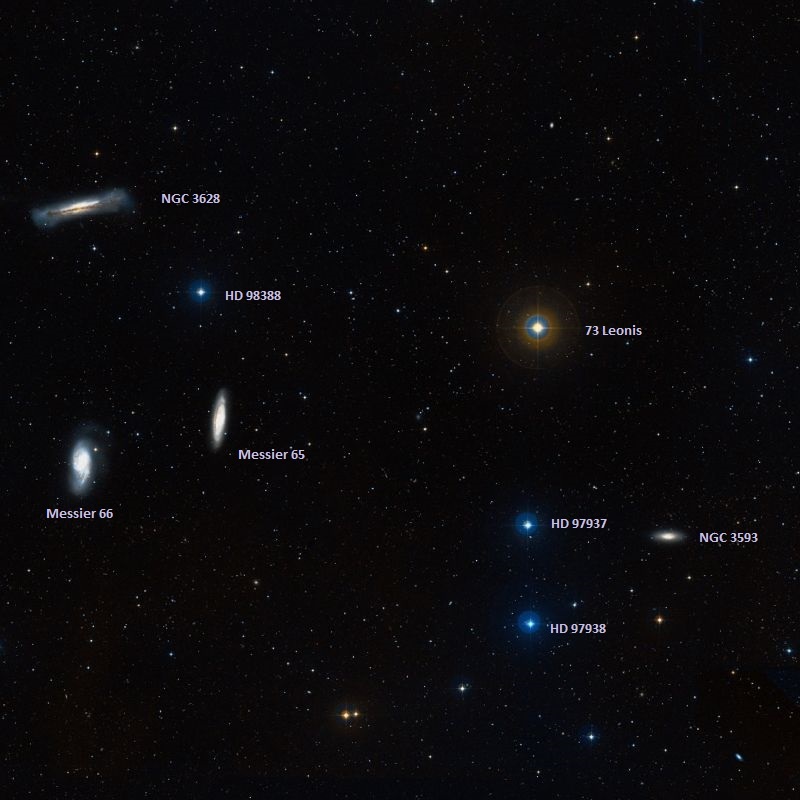 It can be found only 0.5 degrees to the north of the galaxy pair Messier 65 and Messier 66, between the relatively bright stars Theta and Iota Leonis. The Hamburger Galaxy has an apparent magnitude of 10.2 and lies at an approximate distance of 35 million light years from Earth. NGC 3628 forms the famous Leo Triplet (M66 Group) with the spiral galaxies Messier 65 and Messier 66. 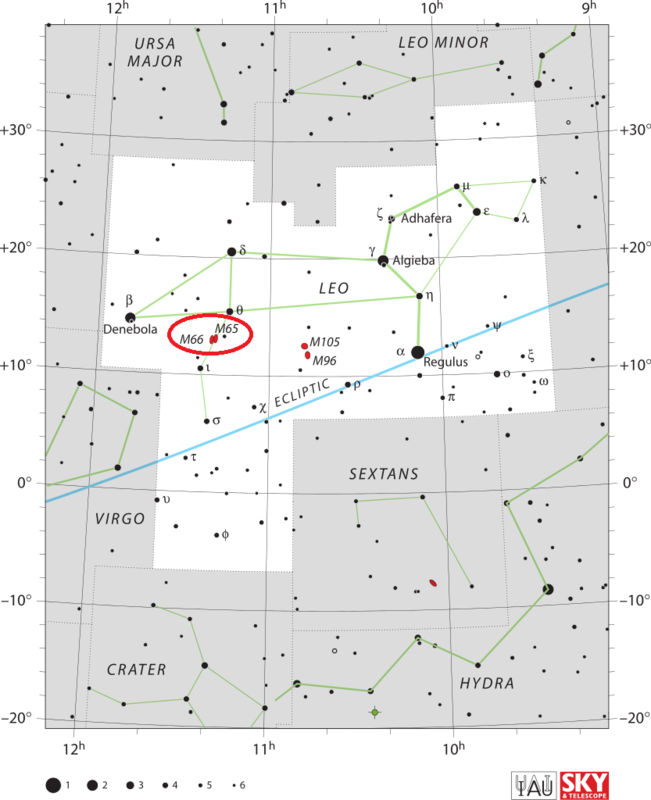 It is the faintest member of the group and the only galaxy in the Leo Triplet that was not catalogued by Charles Messier. It went undetected by the French astronomer and was not discovered until the late 18th century. It was discovered by William Herschel in 1784. He catalogued it as H V.8 on April 8 of that year. The Hamburger Galaxy is known for its broad equatorial band of dust and a vast tidal tail, spanning approximately 300,000 light years. The dust band obscures the galaxy’s central region and the bright young stars that have formed in its spiral arms. Composed of young open star clusters and starburst regions, the galaxy’s tidal tail is believed to be a result of gravitational interaction with the other galaxies in the M66 Group. The stream of stars has been drawn out by tidal forces during violent encounters with the galaxy’s large neighbours. The interaction with M65 and M66 is also believed to be responsible for the warped disk of NGC 3628. A spectroscopic analysis of the galaxy’s disk has revealed that the stars in NGC 3628 orbit in the opposite direction of the gas in the galaxy, likely as a result of a recent galactic merger. The Hamburger Galaxy shares its name with Centaurus A, the fifth brightest galaxy in the sky, located in the constellation Centaurus. NGC 3628 hides its spiral structure because it is seen perfectly edge-on, exactly as we observe the Milky Way on a clear night. 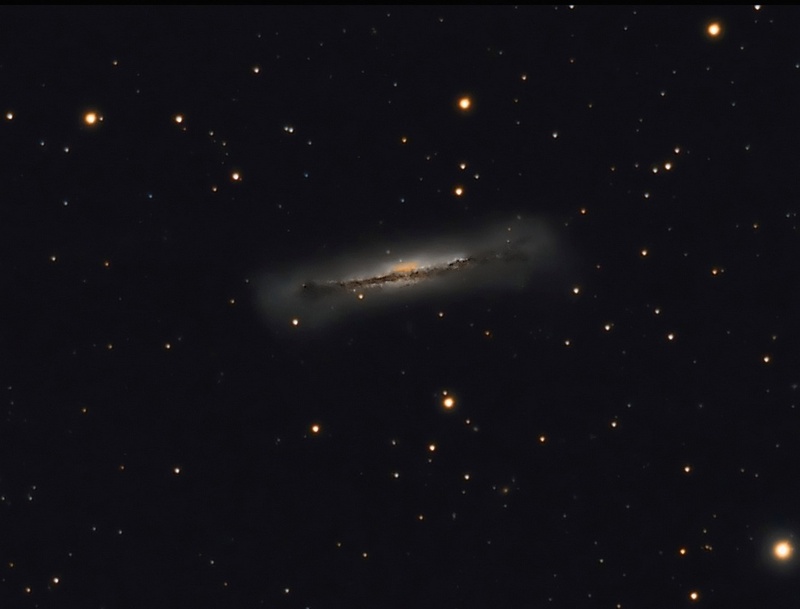 Its most distinctive feature is a dark band of dust that lies across the plane of the disc and which is visibly distorted outwards, as a consequence of the gravitational interaction between NGC 3628 and its bullying companions. This boxy or “peanut-shaped” bulge, seen as a faint X-shape, is formed mainly of young stars and gas and dust, which create the bulge away from the plane of the rest of the galaxy through their powerful motions. 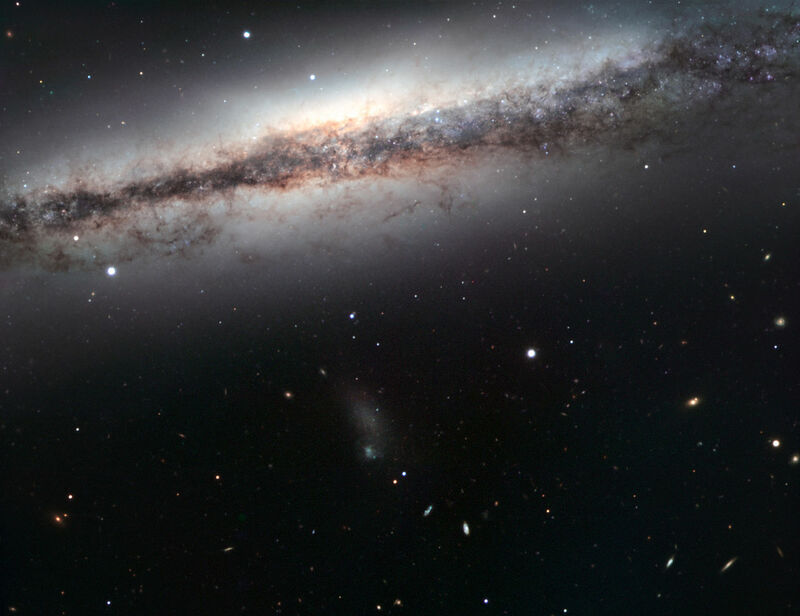 Because of its appearance, NGC 3628 was catalogued as Arp 317 in the Atlas of Peculiar Galaxies, published in 1966, which aimed to characterise a large sample of odd objects that fell outside the standard Hubble classification, to aid understanding of how galaxies evolve.